I got up a couple days ago and found out that Food Fancies had nominated me for a Liebster Award for blogging. What a great way to start the day! As a recipient--and I am in really great company!--I need to give a heartfelt thanks to my nominator Sharon, also known as Little Miss Cupcake, who has a lovely blog Food Fancies and nominate five more people myself. Sharon is hard at work trying to get a cafe opened in Dingle in a few weeks time (!) so I do wish her the absolute best there. Hard to do since there are such great bloggers out there, but I have to say that Nicola Brown at Clasheen is excellent. Great humour and information on felting and always news on the fibre world. I don't know where she gets her energy. 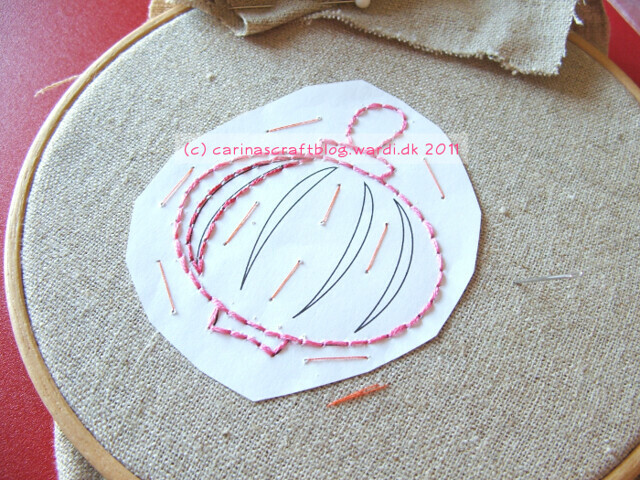 In no particular order, I also love Carina's Craft Blog. Lots of great crochet tutorials here and her fabric designs on Spoonflower are beautiful and colourful. Great for when I get the itch to learn new stitches. I want to felt like Andrea Graham when I grow up! Her blog Andrea Graham Feltmaker has great photography and you can see a huge range of handmade felt items and she is quite on the ball about using the internet to teach students via webcam. Majorly productive and married with kids, not easy folks! I love the combinations of felt and velvet in Dog Daisy Chains blog. She always has such beautiful eye candy and I get motivated to get into the studio and start messing around. And finally A Baked Creation always inspires me to cook or bake something interesting and my son often looks over my shoulder and says "Let's go try that, Mom!" Go find the Lemon Drizzle Cake--dead easy to bang into the oven and so, so good! I love the texture of the cake. My son loves the lemon icing. Some things never change! You really NEED this Lemon Drizzle Cake. So easy and a little too good. 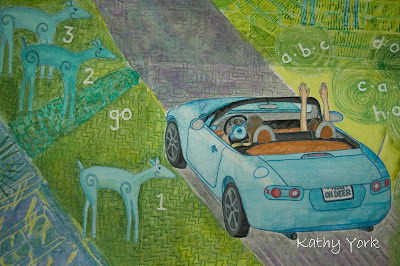 And if I can be cheeky and mention a sixth blog, I love Kathy York's Art Quilts by Kathy York. She makes vibrant, hand-dyed fabrics and great designs and has given me some great ideas for resist-dyeing fabric. Love her quilts and she is so inspiring! 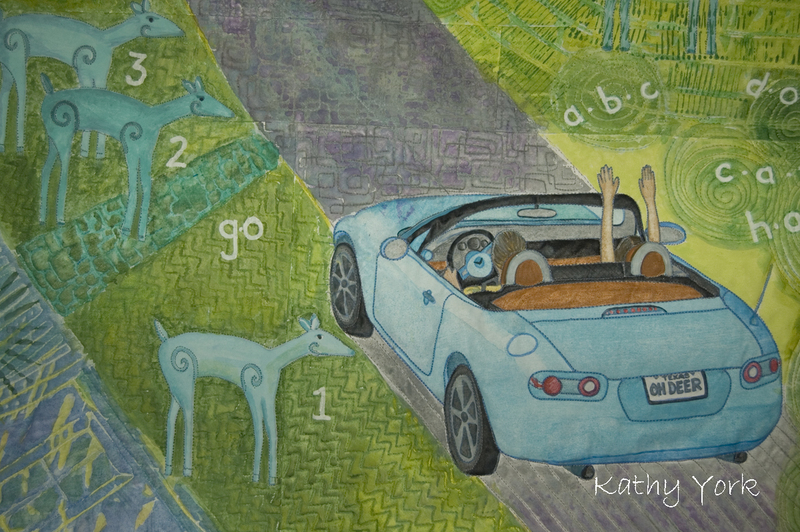 Kathy York's story quilt "Morning Commute with Sweet Jane." When I crochet, it gives me a chance to think a lot. About life, about my son, about things that need to get done. It's a kind of stream-of-consciousness thing where the hands are busy and the brain relaxes and releases random thoughts, things that have been kicking around in the back of my brain. That's what creating does, I think: it allows you to think and feel and interpret life. Life can get pretty hectic at times, so its good to sit down and crochet or muck about in felt and stitch and just try to understand this life we have. I've a couple friends sick at the moment and I am really praying for them, hoping they find their way through it. That they know how many people love them and have the courage to face it all, to keep going no matter how hard it gets. Some people are blessed to know how many friends they have and to feel love all the time. Other people resist it like they don't want to believe it, that the friendship and love are mistakenly given to them and that they can't really accept it. This struggle is hard to witness as they are often lovely people that can't believe in themselves. I sat crocheting late last night and finally gave up and went to bed, with no great insight into how to help. I dreamed all last night of a great friend of mine who is going through a terrible time. I woke with entire sentences of encouragement streaming out of me and I had to get up and get a notebook and start writing it all down. I started sketching designs and had six pages of text and sketches before I knew it. I looked at it critically and realized that most of what I had written had been to help a friend in need, but it would also work in a more generic basis—everyone needs encouragement or a reminder every now and then when they stray off the path they travel in life. I think I may have woken up and developed a whole series of textile collages. The sun is streaming in the dirty windows and I see dust all over the floor and all I can think of is rummaging around my studio until I find the right colour fabric and dyeing new ones and getting started cutting and sewing and beginning the process of making these collages a reality. I will definitely send the words of encouragement out to my friend, but it has already become something more than that. My inspiration well is full this week. So, I'm off to felt/dye/sew on this beautiful, sunny Spring day. I hope you all get outside for your vitamin D! We got up early this morning and made a load of pancakes and sent them off to my son's school. In Ireland, the Tuesday before Lent begins is Pancake Tuesday, the day that extra eggs were used up before Lent commenced. Apparently, in times of old, any luxurious or pleasurable food was also given up for the Lenten period, something that is definitely not followed in modern times! At any rate, the boys should be full and happy by now and ready to face Ash Wednesday tomorrow. More lovely superfine Merino scarves that will by coming at you soon! I have been a quiet blogger lately as there is lots of new things in the works. Not only have I been busy with part-time work, but I have also been re-designing my label and getting ready to relaunch my brand. The fiddly bits of tweaking all the marketing text is time-consuming, but I am happy with the new results. I am having my clothing labels printed as we speak and then I will have to remove all the old ones that I am going forward with and I am busily designing new knitwear items that I will submit for Kerry Fashion Weekend. Lots of details to follow up on to get it right this time. I sent off designs for Project 51 in Dublin and I am waiting hear back from them. 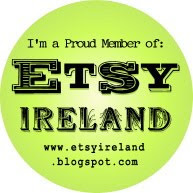 I was very impressed with their artisan range when I visited their booth at Showcase and I'd love to take part in their Festival of Irish Design for March 2012. Fingers crossed there! There are a couple more options coming soon also, but stay tuned for more details! In the meantime, take a look at Aisling Ryan on http://www.fundit.ie/project/a-little-old-a-little-new. She is one of the first craft artisans who is pursuing funding on www.fundit.ie. Fundit has successfully launched many projects, but their crowdfunding endeavors are now helping individuals get financial assistance. Well done to Aisling and the best of luck to her! !